1) Needing to buy new things. When we need to run to the store and buy something because we can’t find scissors or clean socks again, we’re spending a lot of time, energy, and money on unnecessary items. Likewise, when we step on our kid’s favorite toy that’s buried in a clutter pile, we usually dig into our pockets to fork out some cash so we can replace the beloved item. 2) Not wanting to be home. When our houses are a mess, being home isn’t fun or relaxing. So whether it’s going to a movie, hitting the mall, or getting coffee on the town, it’s tempting to spend time and money doing anything except going home to a disaster. When our kitchen counters are piled high with dishes and our fridges are full of moldy items, the last thing we want to do at dinnertime is clean up our mess and search for edible food just so we can sit down to eat. So we go to a restaurant. More time. More gas money. More cash for a dinner out. Maybe you’re storing your items in a storage facility. If so, you probably know the dollar amount. But even if you’re not using a storage facility, you could be spending big bucks to store your stuff. For example, the median home cost is about $200,000. Divide that by an average of 8 rooms per house which would include a kitchen, living room, 2 bathrooms, 3 bedrooms, a basement or garage, and a home office. If just ONE of those 8 rooms in a $200,000 house is filled with clutter, that’s $25,000 for a storage room. That’s not even including the interest you’re paying if you have a loan on your house. If you have two rooms filled with clutter, then you could be spending $50,000 to store your clutter! Renters, you’re not off the hook either! If you rent, multiply your monthly rent by 12, then divide that by the number of rooms you have. For example, $900 rent over the course of a year is $10,800. If you live in a 2 bedroom, 2 bath apartment with a kitchen and living room (6 rooms total), that means you’re paying $1,800 a year for storage. More if you have closets filled with junk. Do the math to find out how much your own clutter is costing you – you might be shocked at the price. If you’re ready to un-bury yourself from clutter so you can save hundreds – or even thousands – of dollars a year, then get my new book, Chaos to Clutter-Free. It’s only $4.99. You’ll save more than that in your first week of going clutter free. Have you ever considered how much your stuff is costing you? 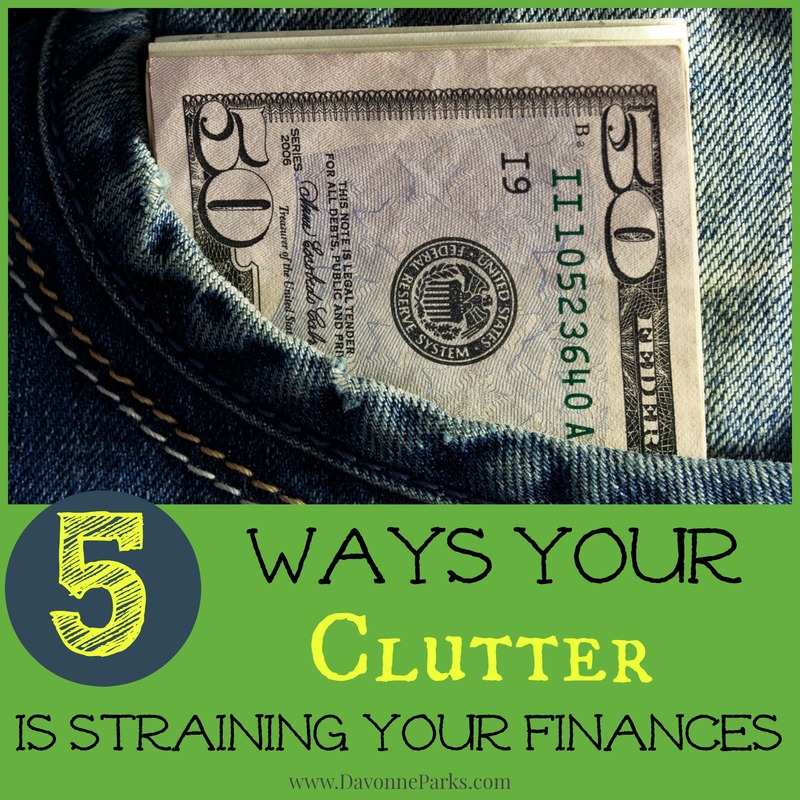 If you got rid of your clutter, what would you do with the cash you’d save? That’s the most ridiculous thing I have ever read.If one of your rooms is filled with clutter it is costing you $25,000. It’s not as if you would be making $25,000 on an empty room. Most people would not be renting that room out or running business from that room. Do not misunderstand, I am not supporting having clutter in a room. But the financial reasoning here is a bit off and a very misleading title. Thanks for stopping by, Dora! You’re correct that most people wouldn’t necessarily be making $25,000 off that empty room. But $25,000 is how much they may be currently paying for a storage space. If all of the clutter was gone, that person could downsize to a smaller home and save a whole lot of cash (maybe even $25,000 or more). That is how I read it. ^ That if the room wasn’t cluttered, and you know longer needed it you could then save the money by downsizing. Which is exactly what we’re doing! We got rid of everything that we did not believe to be useful or beautiful, and now we literally have completely empty rooms! Thanks for the read! That’s amazing, Steph! Thank you so much for sharing and congratulations on decluttering. I know it feels SO good to get rid of the excess! What wonderful advice! It is so much better to downsize and live simply. Thank you for sharing your thoughts! Thank you for your kind encouragement, Cheryl!